In welding, using the correct consumable, or filler material, ensures a strong bond between two metals. It is one of the four components to a weld along with the metal being welded, the heat source, and the shield from the air. As the metal gets heated to its melting point while being shielded from the air, the consumable is added to the area being joined to produce a single piece of metal. The role of the consumable in arc welding is to not only fill in the seam, but also stabilize the flame of the electric arc. The American Welding Society has designated filler material specifications and listed which welding processes each material can be used for. As you can see from the chart, some of the filler materials should only be used in one welding process, such as iron and steel gas welding rods for Oxy-Acetylene (OA) welding. 2 Below are a few different types of electrodes used for some of the most common welding processes. 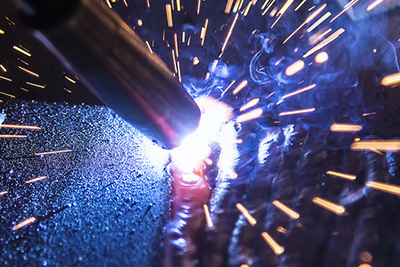 Shielded metal arc welding uses a powder-coated electrode (flux). When it burns off, the coating shields the weld from oxygen. Filler metal is often added to the coating to speed up the process. Gas-tungsten arc welding uses a non-consumable tungsten rod to heat the metal and filler metal. The rod just heats the metal and doesn’t add to the filler material. Gas metal arc welding is a process that uses a wire consumable with a wire spool feeding the wire into the weld joint. Along with ensuring the consumable has the same melting point as the base metal, it’s also critical to match the strength of the filler to the strength of the metals being welded to get the best results. However, “matching” the strength of the base metal with the filler material isn’t as simple as matching the strength classifications of metals using a chart because base and filler metals have different minimum yield and tensile strengths. The yield strength is the amount of stress a material can handle before it starts to deform plastically, while the tensile strength is the amount of stress a material can take before it breaks. As you can see, there are a variety of factors that go into selecting the right consumable for the job. Choosing the right material increases weld strength and bead quality and makes cleanup easier. As you progress in your welding studies, you’ll gain more experience with these essential welding components, as well as the various welding processes you’ll master before you enter the field.